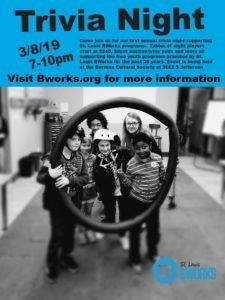 BWorks inaugural trivia night will be a night you don’t want to miss! Our goal on Friday, March 8th is to raise awareness for BWorks and our mission, raise money to support our programs for kids and have fun with so many friends from around the St Louis region. We have 30 tables available with room for eight people at each table. We look forward to seeing you at the event and filling the room for this huge event for the kids. Please reserve a table today! The cost is $240 for a table including beer and soda for eight people or $30/person for individuals who don’t have a team. After signing up below, To reserve your table click here! For complete information visit our Event’s page.